John Atkinson/Contributing Photographer Senior midfielder Rebecca Golderman tallied her second hat trick of the season in an abysmal road loss to Cornell, the team’s worst defeat in four years. 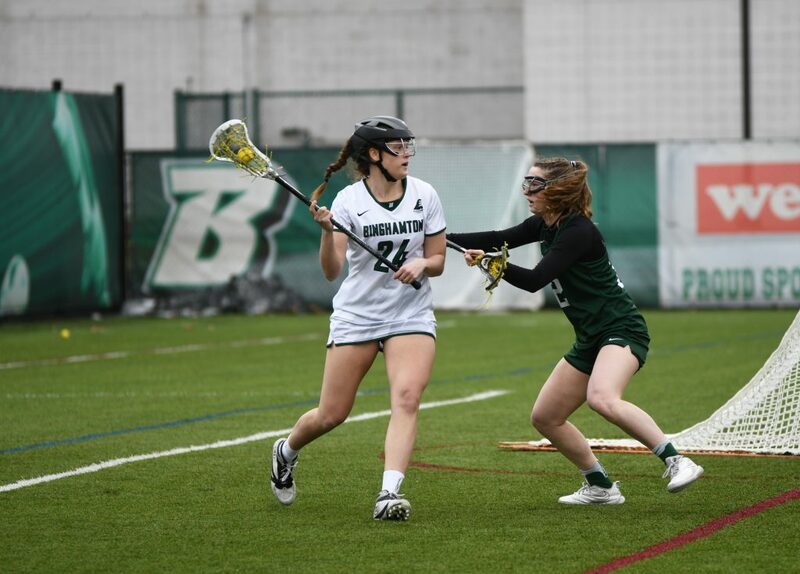 In a disappointing road loss, the Binghamton women’s lacrosse team took on upstate rival Cornell in Ithaca, New York on Wednesday, facing the same struggles that it faced all season. After losing the first game of conference play to New Hampshire last Saturday, the Bearcats (0-10, 0-1 America East) added another loss to one of the worst starts in school history, getting blown out 23-5 by the Big Red (5-4, 2-1 AE). Binghamton has had similar unfortunate results against Cornell in the past; on March 11, 2015, the Bearcats were defeated by 19 goals. Wednesday’s defeat was the biggest blowout since that game. Cornell fired off 39 shots in the contest, a remarkable 35 of which went on goal. BU turned the ball over 18 times compared to the Big Red’s 12 giveaways. In addition, Cornell was able to get more draw controls and ground balls, allowing them to penetrate to the net with strength past the Bearcats’ porous defense. Though senior midfielder Rebecca Golderman started the game’s scoring, Cornell quickly tied the match 1-1 with a goal by senior attacker Sarah Phillips. After another score, this time by Cornell senior attacker Tomasina Leska, Golderman scored two more goals in the game, logging a hat trick for Binghamton’s first three goals of the evening. Cornell managed to pull ahead 5-3 on another score from Leska, and just a few minutes later she assisted on a goal, bringing the Big Red’s lead up to five. Bearcat freshman attacker Sidra Morchower scored her first career goal to make the score 8-4. For the rest of the game, though, a massive differentiation took place between the two opposing teams. Cornell scored four times in the last five minutes of the half, bringing the score to 12-4 to end the half. As the players returned to the field in the second half, Cornell scored 10 unanswered goals before the only second-half goal for BU was scored by senior midfielder Ciara Gordon on a pass from sophomore attacker Paige Volkmann. Following this BU score were five consecutive by Cornell, the last two by sophomore attacker Ally Tetreault, to finish the match with a score of 23-5 and leaving the Bearcats defeated in a blowout loss. There was a huge disparity in the number of shots throughout the game, with Cornell outshooting Binghamton by 22. In most games this season, BU has been competitive despite its record. A drop-off in performance from last year’s historic season was certainly expected, given the talented class of seniors that departed. However, the team has consistently shown an inability to close out games. In a few occasions, such as the matchup as well as the game against fellow Ivy League opponent Dartmouth, the Bearcats were positively outclassed. With a more challenging matchup on Saturday against the second-best team in the AE, the Albany Great Danes, the team will have to improve substantially, or risk dropping to 0-11. First draw control against Albany is set for 1 p.m. on Saturday, March 30 at the Bearcats Sports Complex in Vestal, New York.